Boost sales, drive traffic, and grow your list when you combine features that work together. During the holidays, we all get our fill of cookies, cakes, pies, and assorted treats. So rather than indulging you with more baked goods, we’ve cooked up a different kind of recipe. We love these 3 dynamic product combinations, because they’re proven to help grow your business. Is there any tradition more festive than a holiday sale? It’s a great way to generate more revenue, but perhaps more importantly, it can be a great way to thank your best customers. For quick and easy success, try hosting a sale exclusively for customers who were loyal all year long. Build a landing page with a promo code. Begin by creating a branded landing page for free. Include information about your business, as well as your best product photography. Place a promo code in a prominent area of the page to entice shoppers. Identify your audience. If your store is connected to Mailchimp, you can find your best customers in a few different ways. Choose to identify people who purchased something recently, spent a specific dollar amount, or are most likely to click on your campaigns. 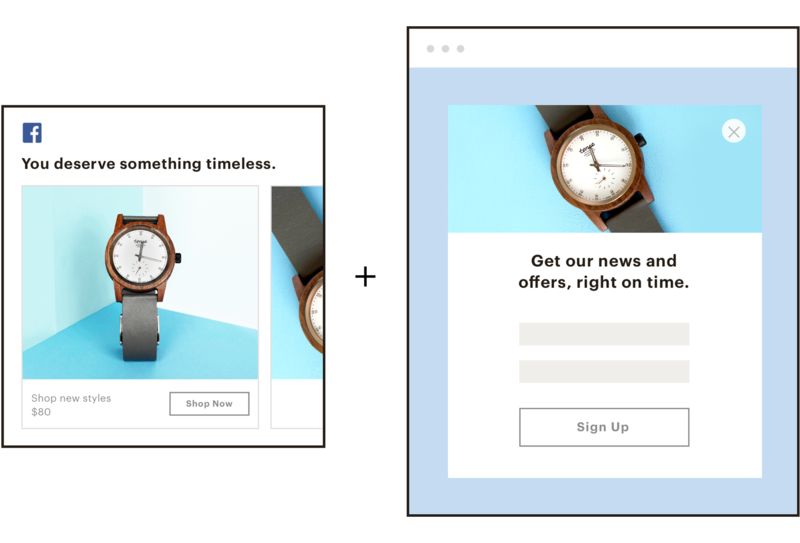 Design an email to your best customers. 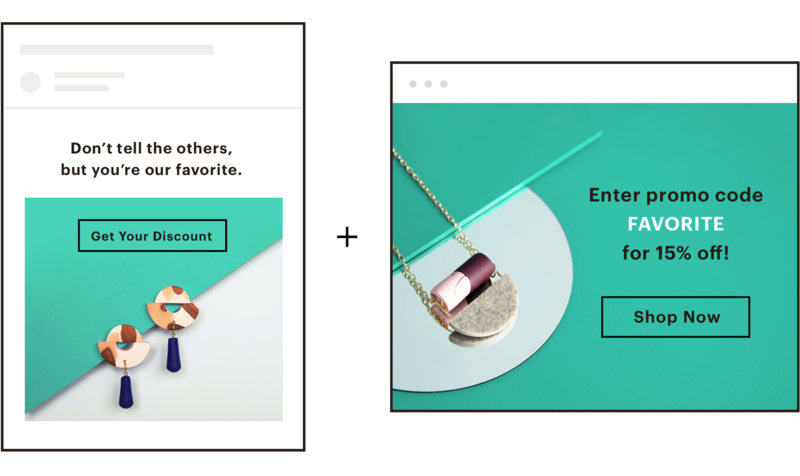 Once you’ve selected your audience, you can design an email that directs them to your landing page where they’ll find the exclusive promo code. Turn on the best customers automation. With the email and landing page ready for action, turn on the automation and start sending your loyal fans straight to your sale. The holidays are a great time to invite more people into your store. Whether it’s for a special holiday sale, to view a new seasonal line, or for an in-store party, you can use this opportunity to win people over with hospitality. Aside from offering them a discount for coming in, consider having refreshments, decorations, and music to create a festive atmosphere. When you make an impression on people IRL, it’s sure to stick. Design a postcard. Between gift packages and holiday cards, people are watching their mail during the holidays. This makes it a great time to reach new people with postcards. Create a postcard with a warmly worded invite to your store and important details like location and hours. Include a promo code to be redeemed in-person. Set your budget and audience. Choose your budget first to determine how many postcards you can send. Based on that number, target the people on your list who you’d like to invite into your store. Don’t have their mailing addresses? We’ll help you find them. Choose a follow-up date. Select a date based on when you send the postcard. For example, you could set an automation for a week or 10 days after the postcards send. Design and send your email. 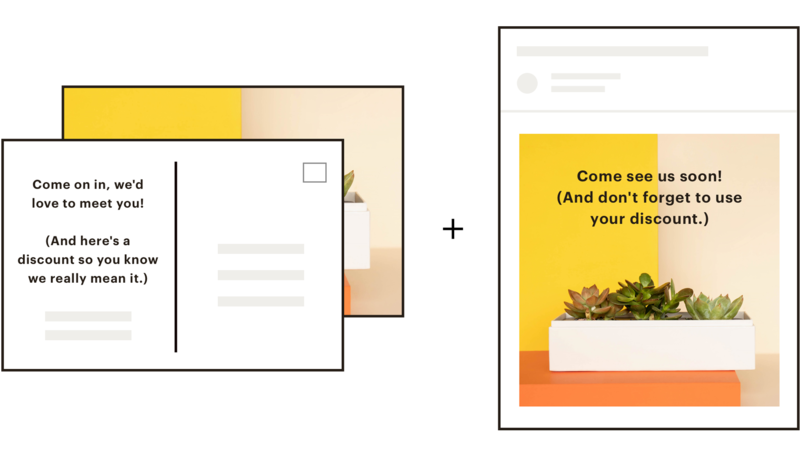 With our templates and easy-to-use designer, you can quickly, easily create an email reminding people to visit your store and use the discount code you included on the postcard. This recipe is an old favorite that’s especially useful during this season, because it gives you a way to turn people who are holiday shopping online into loyal fans. And with 32 days between Thanksgiving and Christmas this year (the longest possible gap between these 2 days) there’s extra time to turn online shoppers into followers. Draw people in with an enticing Facebook ad, capture what you need to know about them with a customized pop-up form, and grow your list. Design your pop-up form. Think about what you’d like to know about the new people on your list, and include fields for them to provide that information. Use your best photos, brand elements, and these design tips to make the form effective. Put your pop-up form on your site. If you connect your site to Mailchimp, you can publish your form in one click. Otherwise, you can paste the code for the form into your site’s HTML. You can even choose when you want the form to show up on your site. Target people like the ones on your list. Using the data collected automatically in your Mailchimp account, you can create an ad targeted to people who share interests, behaviors, and demographics with the people on your list currently. Build a Facebook ad. You want to create an ad that does more than look good—you need it to lead to conversions. Aside from including your website’s URL (where they’ll find your pop-up form), you’ll want to use the right images to make them click. Set your budget. The budget you set for your ad is the maximum amount you’re willing to spend on it. So select the right amount for you (it can be as little as $5). But keep in mind that you’ll only get charged for each person who clicks the ad.